She got pregnant at the age of 18 and became a single parent at 33. She endured a lot just to make a living. She was able to send her kids to school and put food on the table. She loved them dearly. And when God told her, “It’s now time to leave,” she didn’t complain. She relinquished her “best-mom-in-the-world” crown and followed Christ’s plan. Her name is Connie Cruz-Garcia, a prolific and full-time missionary who transforms lives in Siem Reap, Cambodia. Though she considered it as an unexpected calling, Connie allowed God to take over and orchestrate everything on her behalf. She trusted Him to use her in many ways that she couldn’t understand, and with the help of the Asian Center for Missions (ACM), she was able to teach orphans the importance of Jesus Christ. She didn’t expect that her ministry in their local church is already a part of God’s plan in making her a full-fledged Sunday school teacher in Siem Reap. She didn’t realise that she would eventually decide to spend her whole life teaching and loving kids. “I lift everything up to God, I am just His steward, I am just following His lead,” Connie shared. For Connie, leaving her family wasn’t easy, but because God prepared her well for this ministry, (her two kids are already college graduates), she is confident that He has great plans for them. “I am not the type of person who plans ahead of time. On my first day in Cambodia, I asked God to give me a sign whether I will stay here for a long time or not. I didn’t have a definite plan, but when I saw that the people there are in dire need of teachers like me, I know God is looking straight at me and telling me to stay,” said Connie. Even the kids living in their neighborhood long for her like lost souls chasing for attention, “Apart from the orphans that we are ministering to, we also invite kids from our neighborhood to join our class. They really want to learn English and they love listening to Bible stories!” Connie added. Aside from all the amusing stories she encountered while riding her motorcycle going to school and church, Connie mentioned the kid who touched her heart the most and made her testimony more poignant and beautiful. “His name is Pitour,” she whispered. “Their house is located just a few meters away from our church. Our pastor has been profusely sharing the gospel to his parents even before I came,” Connie shared. “When I discovered that Pitour really wanted to learn and attend our class, I asked for his father’s permission. Fortunately, he agreed on one condition: that we will only teach him English. Of course I said yes!” she exclaimed. “As Pitour joined our class, his family struggled to make a living. Things got worse when another baby was added to their family. From bread and milk, the family ended up having rice broth (am) for their meals. Everyone in our church tried to send them help. We comforted her mother while his father tried to look for money and gambled,” Connie said. After months of actively attending worship service, Pitour’s mother decided to get baptized. “My heart swelled with gladness the moment Pitour and his sister, Julie, were dedicated. Their family found a new home in us,” Connie narrated. As of this writing, Pitour’s father prefers listening to the service a few meters away from the church. His family is still praying that one day, he will also join them in praising God and accept Jesus as his personal Lord and Savior. Connie leading prayer at the international school where she teaches. 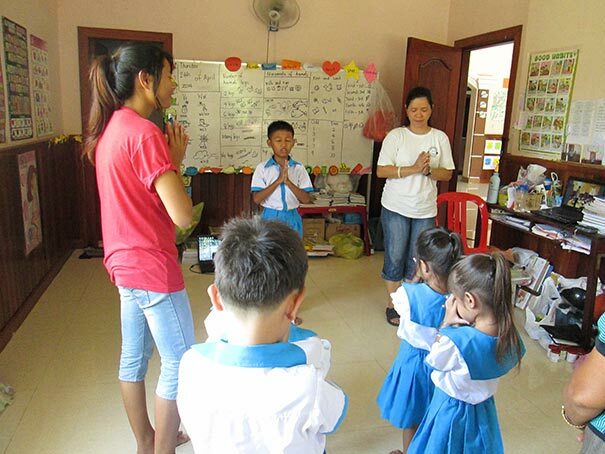 Aside from working as a Sunday school teacher, Connie also taught at an international school in Cambodia. There she experienced being persecuted for being a Christian who prays in the name of Jesus. Except for the school director, almost everyone in the school is a Buddhist. She was not allowed to teach the students anything related to the gospel. “So what I did was to teach my students to pray. We prayed to God but we didn’t mention Jesus since they don’t want to hear his name. I also taught them some Christian songs not mentioning Jesus but nonetheless praising God like Father Abraham and I’ve Got Peace. In that way, God is still being glorified,” Connie explained. Her stay in Cambodia also taught her how to manage her expenses, how to be practical and how to be more faithful to God. “Honestly, I can say that I didn’t struggle financially because of my simple lifestyle. I even set an example to other believers on how one can be more faithful in setting aside money for tithes despite the small amount that we’re receiving from our day job. They started being faithful when they saw me doing it. I showed them that this is what the Lord is telling us. It’s not from me, it’s in the Bible and it’s a commandment. If you follow the Lord, He will bless you,” said Connie. In spite of the challenges, Connie continues to fulfill God’s plan for her life and lead people to Christ. Connie quotes Philippians 4:13, “I can do all things through Him who gives me strength,” as her life verse that continues to remind her of the powerful and loving God who continuously guides her. Connie is now spending time with her family in the Philippines and will be back in Cambodia next month to continue her journey. 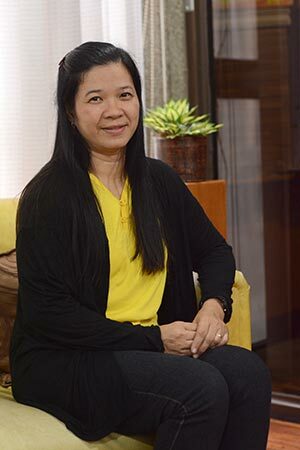 You can also lead people to Christ by helping ACM train more Filipinos like Connie. Visit the Asian Center for Missions’ website at www.acmnet.org to find out how you can be an instrument in transforming lives for Christ. By Sheena Ferrer, Writer, CBN Asia, Inc.